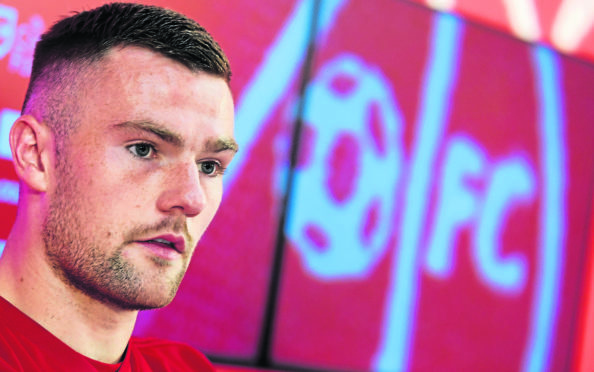 Aberdeen defender Mikey Devlin is ready for a step into the unknown as he tries to deal with the threat posed by Rangers talisman Alfredo Morelos. The Dons host the Gers in tomorrow’s eagerly anticipated Scottish Cup quarter-final at Pittodrie with a crowd of around 19,000 expected. Morelos has scored seven goals in his last three games, including two against the Dons in a 4-2 victory at Pittodrie before he was sent off following an altercation with defender Scott McKenna. Along with picking up four red cards and 15 bookings, Morelos has hit the back of the net 28 times in 41 games this season and former Hamilton captain Devlin knows the Dons will need to keep the Colombian quiet if they are to progress to the final four of the competition. The Dons defender said: “He’s a good player. His goals speak for themselves. We know that he’s a handful. “We know he can cause problems if you don’t take care of him. “Whatever defence is picked come Sunday will know they have a tough job of keeping him quiet. “I’ve only played against him for 10 minutes (in August) and then he got sent off. “He missed the cup semi-final, which I played in, and he played in the game at Ibrox which I was injured for then I didn’t play in the game here. “You’ve got to relish those challenges. I think, as any player, you want to play in the biggest games against the biggest players. Certainly, on current form, he’s one of the best players in the league and certainly one of the best goalscorers. You look forward to that and it gives you a test. “You need to pay him close attention. You can’t give him space to operate in. He doesn’t take long to get his shots away and he’s lethal in the box. Morelos has been sent off in all three appearances against the Dons this season but Devlin doesn’t expect the 22-year-old to be holding anything back tomorrow. He said: “He plays right on the line but I think that’s what makes him so good, that he plays with that bit of fire in his game. That’s what makes him a handful. That’s a side of the game that you look forward to. “You’ve got a player who won’t hold back and he’ll use whatever he can to make sure his performance levels are where they want to be.